Multi-angle Imaging SpectroRadiometer (MISR) images of Delaware Bay, Chesapeake Bay, and the Appalachian Mountains acquired on March 24, 2000 during Terra orbit 1417. The large image on the right was taken by the MISR camera viewing straight down (nadir). The series of smaller images, from top to bottom, respectively, were taken by cameras viewing 70.5 degrees forward, 45.6 degrees forward, 45.6 degrees aftward, and 70.5 degrees aftward of nadir. 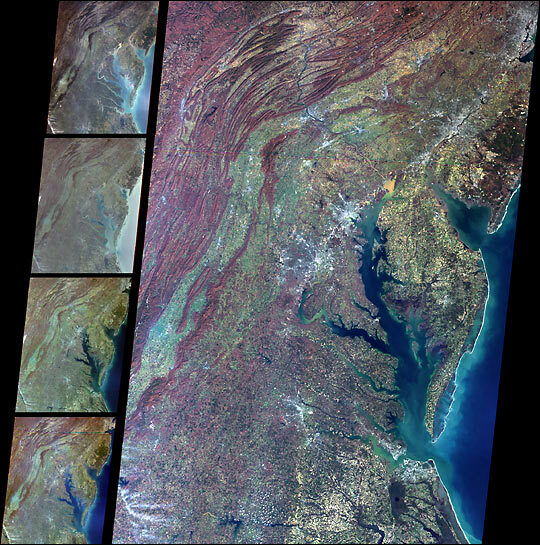 These images cover the environs of Newark, Philadelphia, Baltimore, Washington, and Richmond. Differences in brightness, color, and contrast as a function of view angle are visible over both land and water. Scientists are using MISR data to monitor changes in clouds, Earths surface, and pollution particles in the air, and to assess their impact on climate. For more information, see the MISR web site. Images by NASA/GSFC/JPL, MISR Science Team.